This is a Konadicure from last week - I will call it Blue Jay. It is only my third attempt at Konad, as well as my first try layering two designs. 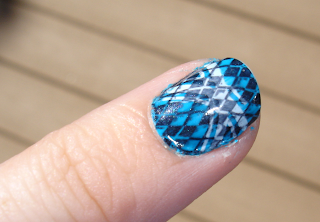 For this I used Sally Hansen Blue Me Away!, and then Konad plates M60 and M64 for the patterns, with Konad special polish in black and white, respectively. I feel like the finished effect was almost like a bluejay's wings (although a very brightly colored bluejay). I really loved the Blue Me Away polish, it went on very easy, covered beautifully in two coats, had pretty speedy drying time and was a gorgeous blue. I wish I had taken a picture of the blue itself - next time! Overall I was pleased with this manicure, even if the final product was a big different than expected. I had some issues with the Konad on this manicure, as well as some of the same issues on previous attempts. Other than my obvious need to practice getting these centered and covering the whole nail in some cases! I am hoping some of you that are more experienced with Konad will be able to answer these questions; any advice is appreciated! 1. I notice that when I Konad, the patterns are not always perfectly clean. You can see some here, especially on the argyle pattern, that there are little black lines or splotches where there shouldn't be. Is this because I am not scraping the polish off enough before I roll the stamp on the plate, or is it the rolling/application itself? 2. I have also had a problem with Konad smudging when I paint on the top coat. I have even waited up to 20 minutes after applying the Konad print to top coat, but still it smudges a bit when I apply the top coat. It is not as bad here, but it was even worse on my non-picture hand. I have been using OPI Rapid Dry top coat, although I did get some Seche Vite and am going to try that out tonight. Do I just need to wait longer, or is the switch in top coats going to help? 3. Finally for my most obvious (to me, at least!) problem of this manicure - I put the white stripes on AFTER the black argyle. This looked fine until I applied the top coat; then the black showed through the white, with the final result as shown above. I assume this could be fixed by applying a top coat after the black, then doing the white, then another top coat? Or is there something else I should be doing? You are doing so great. I love this. Orlicia - Thanks, I had actually planned on doing something different when I sat down to do this, and then the idea for this just kind of popped into my head. 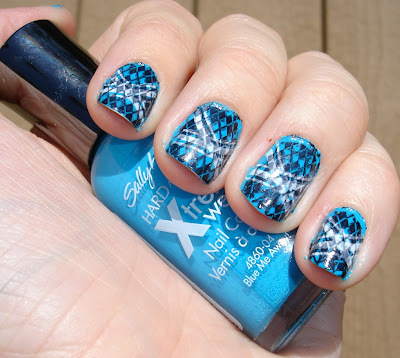 Alice - I wish I had the time/skill to do such pretty free-hand nail art, yours is gorgeous! Susie - I used the Seche Vite last night, and was very careful about application, and it didn't seem to smudge, yay! Perhaps it was a combination of the application as well as maybe my particular OPI top coat (which I still love as well, so will use for non-Konad nails). *I was scraping TOO hard and pulling polish off the image, this may be why you aren't getting a crisp design. Are you using the scraper or a gift card? An old gift card or credit card is much kinder to your plate and I would scrape at a 45 degree angle softly. *I've used nothing other than Seche Vite w/stamping and it works wonderfully! I think it's your topcoat. I've also read to run your nails under cold water after stamping and before adding a top coat. *I've been "rolling" too hard and not picking up the image. You would think the harder you pick up the image w/your stamp the better right? The softer I've done the roll the better my image is. *I would also file down your stamp so it picks up polish better.